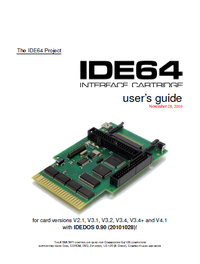 The IDE64 is an ATA/ATAPI interface cartridge for the C64 and the C128 (in C64 mode). The latest version (v4.1) was released in March 2009. The IDE64 was originally developed in 1994 by Tomas Pribyl and Jan Vorlicek. The current custodian is Josef Soucek. Real-time data transfer between C64/C128 and a PC. Timestamping of files with a real-time clock. Compatibility with GEOS and WINGs. 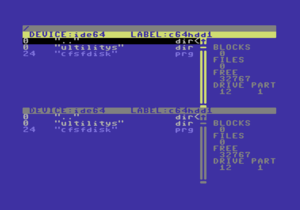 IDE64-DOS V.90 firmware, switchable between C64 Standard and C64 SuperCPU (from v3.4+,) and includes support for. Streaming HiRes video at 25 fps. The IDE64 consists of a PCBA (components in Table 1) which connects to the expansion port. v4.1 March 2009 (Pre-release August 2009) The hardware was redesigned to use surface-mounted parts and a more up-to-date ispMACHCPLD, which resulted in a much shorter board. An USB serial FIFO chip was added for fast PCLink connections. An Amiga clock-port was added for connecting additional devices. The CF socket is separated from the parallel ATA port; which is more compatible to strange CF cards. The I/O interface was changed to support 128 kB OS and was tweaked for slightly faster data transfer speeds. The CF socket needs no additional power supply, and has a low power consumption (approx. 140mA). Standard ATA hard disk drives and CD/DVD ROMs, with or without a CF socket option, can now be used. 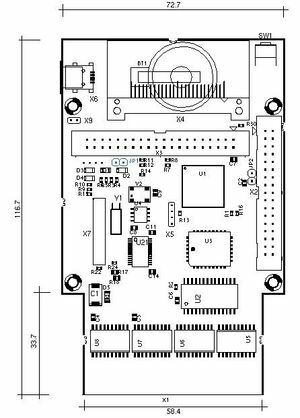 v3.4+ 2005 The EEPROM was upgraded to 128 kB. The OS was now switchable between standard C64 and SuperCPU; this solved the reflashing problem for those with SuperCPU-equipped systems. v3.4 2004 A CF socket was added. v3.1 2001 The expansion port pass-through was removed. v2.1 1999 The logic was combined onto a single ispLSI PLD. The OS became upgradable on a 32 kB EEPROM. The buffer was increased to 28 kB. The ShortBus connector was added; originally designed for LCD displays and SSD LEDs. SuperCPU compatibility was included. v1.1 December 1997 The logic was fitted into 2 ispLSI PLDs. The OS was burned into a 32 kB EEPROM. The buffer consisted of 16 kB RAM. Timestamping ans settings were enabled by a DS1302 real-time clock and additional battery. Peripherals were added by a parallel ATA connector. An expansion port pass-through allowed other cartridges to be attached. ETH64. A 10 Mbit LAN91C96-based Ethernet card. DUART. A XR68C681-based dual RS-232 card. RR-Net. 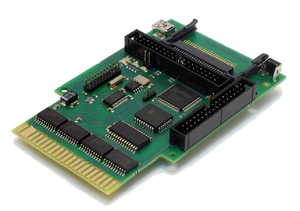 A CS8900a-based networking card. DigiMAX. A MAX506-based 4 channel 8-bit digital-to-analogue converter card. ETFE. A CS8900-based networking card. The IDE64 has 19 new BASIC commands. 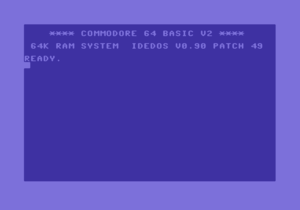 F2 %:* chr$(13) - LOAD":*,dr,1"
The key combinations C= +RESTORE start the monitor for coding assembler programs. This page was last modified on 21 March 2015, at 00:47.